HELP SEND PEOPLE FROM FERGUSON-ST.LOUIS TO RISE UP OCTOBER TO STOP POLICE MURDER NATIONAL MARCH IN NYC OCT. 24. $8000 IS URGENTLY NEEDED BY OCT. 13TH TO SECURE A BUS to take defiant youth, victims of police terror, students and people of conscience from Ferguson-St. Louis to New York City for the Rise Up October national march to STOP Police Terror on Oct. 24th. It really matters that Ferguson-St. Louis be among the tens of thousands of people flooding NYC streets before the eyes of the whole world, challenging everybody to answer “Which Side Are You On?” It also really matters if there’s a powerful contingent of people from Ferguson-STL (the place where the nationwide movement to stop police terror was born, and which has faced non stop efforts to repress and derail it ever since) is marching in the streets together with the 100 families of people murdered by police, students from across the country, defiant youth from powerful uprisings from Oakland to Baltimore, and people of faith willing to put their bodies on the line. At a moment when the powers-that-be are working to bury this movement with repression, lies, false promises, or through galvanizing reactionary forces spewing venom against Black Lives Matter and Black people generally, there’s great necessity to grow this movement by having the kind of outpouring that will inspire many more to stand up and to rock the brutal enforcers back on their heels. 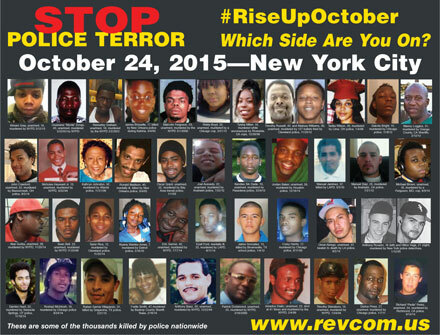 This is what RiseUpOctober is all about. Think about the impact that a vocal contingent from Fergusoncan have on such an outpouring! And think what it will mean if Ferguson isn’t in the house. All donations will go to pay travel costs for peple from Ferguson-STL to NYC for #RiseUpOctober. If bus in not secured, funds will go for renting vans. Contribute $140 to buy your own ticket, or to sponsor and pay for a ticket for a protester from Ferguson to go to NYC. #RiseUpOctober national march, initiated by Dr. Cornel West andCarl Dix, will bring many thousands from around the country to join with many thousands from NY. It needs to be an unprecedented outpouring of protest and resistance to STOP the epidemic of police terror and to awaken and inspire millions, and sharply raise the question to society and the world – WHICH SIDE ARE YOU ON? Through the actions on October 22-24 and everything building up to it, Rise Up October aims to get things to the point where there are millions who both feel in their bones that this system of intimidation, terror and murder is INTOLERABLE… and are willing to step out and act in all different ways to stop this, and have the ways to do so. In other words, these actions in October aim to change the whole tenor and direction of society. Your donation will send a powerful delegation to the Rise Up October national march in NYC. The contingent going from St. Louis and Truman State University includes several family members who lost loved ones to police murder, students, and protesters who have been in the streets of Ferguson since Mike Brown was killed in August 2014. Funds will cover vans going from St. Louis; seats on a #RiseUpOctober chartered bus leaving from Chicago to NYC; and plane fares for 2 family members with a loved one killed by police. We are going to NYC because the world has to know, because everyone must be challenged to decide "Which Side Are You On," and because Police Terror Must STOP. Thank you for donating. The St. Louis delegation going to RiseUpOctober national march includes several family members with loved ones killed by police; protesters who have been in the streets since Mike Brown was murdered over a year ago; students from Truman State University. The travel plan to take people from Ferguson-St. Louis to NYC for Rise Up October National March has changed. Travel plan, which your donations go to cover,now involves: renting 2 large vans; getting seats on a #RiseUpOctober chartered bus leaving from Chicago to NYC; and one plane fare for a family member with a loved one killed by police. Our goal now is $3800 of which $1322 has been raised. This is a change from the original plan to rent a charter bus from St. Louis, which the initial $8000 goal was based on. We are for recognition of unfair treatment by those abusing both the so-called power and authority position they unjustly hold.